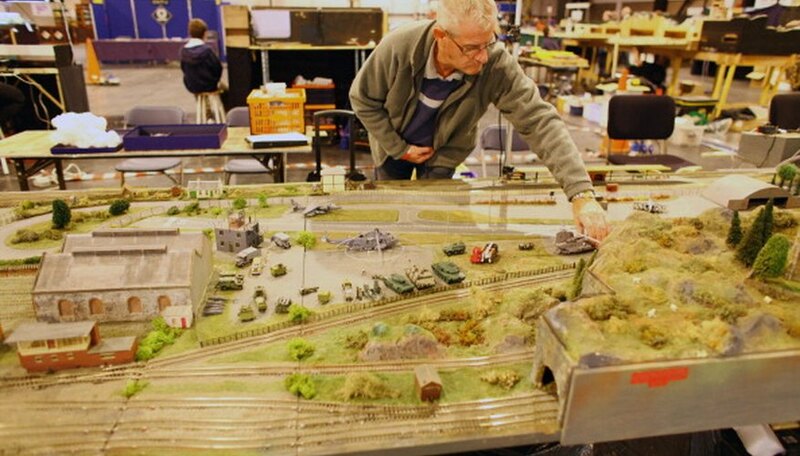 The joy of finding a box of model railroad products in a parent's basement or garage sale can quickly turn to dismay when the tracks are rusted. Model railroads require a clean track to provide power as well as a stable surface for the trains. Thankfully, cleaning track can be done relatively easy with items found in any hardware store, preventing the need to purchase expensive replacement track. Soak the tracks overnight in a rust removal solution. Make sure the tracks are covered completely. Scrub the tracks with a soft scrubbing pad. This will help remove rust after the rust remover seeps into it. Coat a rag with a rust remover spray and spot-clean any portions of the tracks that still have rust on them. Run the track through the dishwasher. The water jets will shake loose the remainder of the rust. Dry the track thoroughly to prevent the water from the dishwasher from causing additional rust. Once tracks are free of rust for trains to run on them, purchase a cleaning car to automate track maintenance and keep them rust-free in the future. Never use steel wool or any hard, abrasive product to clean your tracks, as it will damage the nickel plating and iron underneath. The Model Railroader: Keep Those Model Train Tracks Clear -- And Clean! How do I Mount a Train on Walls?